An international team of scientists is studying the effects of the 2010 Deepwater Horizon spill – by looking back at another spill 35 years ago in the Gulf of Mexico. 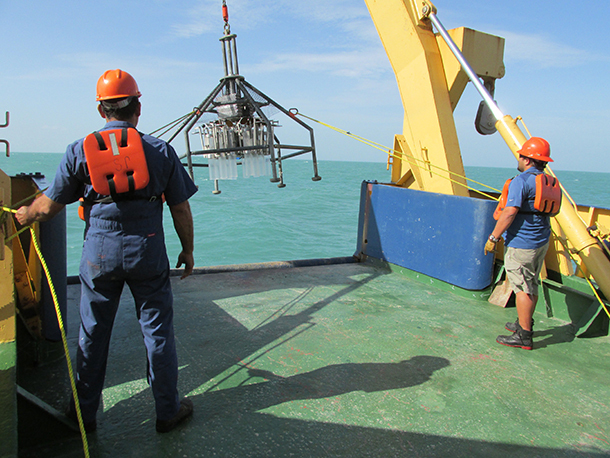 In this report, tag along as Mexican and American researchers unearth sediment cores from the ocean floor near the site of the Ixtoc oil well blowout that reveal how the seabed reacted. This piece aired nationally on PRI’s “Living on Earth” , April 7, 2016. The deadly Deepwater Horizon blow-out spewed huge amounts of oil into the Gulf of Mexico in 2010, and scientists have been working ever since to understand its long term effects. Now, an international team of scientists from C-IMAGE — That’s the Center for Integrated Modeling and Analysis of the Gulf Ecosystem — has been looking to a different spill that happened 35 years ago off the coast of Mexico for some clues, and as David Levin reports, the aftermath of that disaster is giving them insights into the future health of the Gulf of Mexico. LEVIN: It’s just before dawn, and I’m stepping into a tiny fishing boat in Ciudad del Carmen, Mexico. We’re sitting in a small inlet, hidden by thick mangroves, and nearby, big fiberglass yachts rock gently in the water. They’re from all over Mexico, even Louisiana and Delaware, and they’re drawn here by one thing: oil. Just offshore, there are hundreds of wells in the Gulf of Mexico. Today, we’re heading 15 miles off the coast, into the heart of those wells, to meet up with a Mexican ship called the Justo Sierra. LEVIN: Aboard this ship, two dozen Mexican and American researchers are studying a massive spill that happened here more than three decades ago. In 1979 a well called Ixtoc 1 exploded, spewing millions of barrels of oil into the water. Until the Deepwater Horizon, it was the biggest spill ever to hit the Gulf of Mexico. But scientists still don’t know exactly how it affected the environment, and this what they’re looking into now. By studying how this region recovered, they’re hoping it’ll say something about the impact of major spills decades after they happen. LEVIN: An hour later, I arrive. At 160 feet long, the Justo Sierra dwarfs our little fishing boat, and the ship’s captain has to improvise to get me aboard. ORTEGA-ORTIZ: So he recommends that you pack your gear so you can use all your hands. Every step you take, you really need to commit. LEVIN: That’s Joel Ortega Ortiz from the University of South Florida. He’s my guide on this trip and the first one to scale a 20 foot rope ladder the crew drops over the side. LEVIN: A wave kicks up and rocks the boat, and Joel sees his chance. He swings onto the side, and in a few steps, he’s onboard. And now it’s my turn. 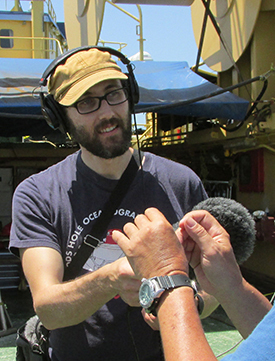 And, by the way, climbing the side of a ship while holding a microphone is way harder I thought. HOLLANDER: Welcome aboard man, good to see you! LEVIN: David Hollander is one of the scientists who organized this cruise. He’s the principal investigator of a team of researchers called C-IMAGE, and he’s here to collect sediments from the ocean floor. HOLLANDER: Understanding the events that happened in the Ixtoc will give us a vision for what we can expect in the northern Gulf of Mexico over the next couple of decades around the Deepwater Horizon. 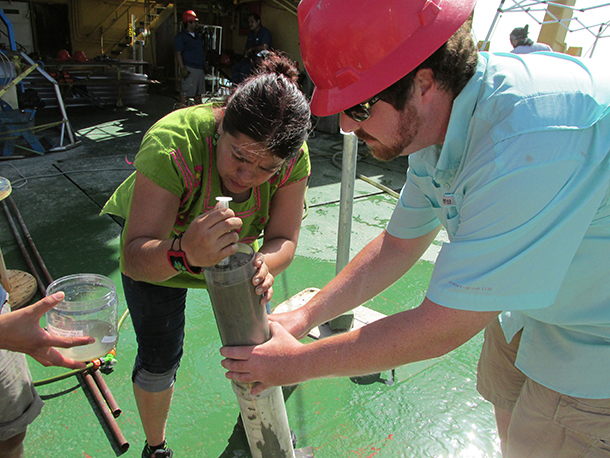 LEVIN: To get those sediments, Hollander and his team are using something called a multi-corer. It’s a cone-shaped cage of pipes, about 10 feet tall. Looks like an unfriendly jungle gym. When it hits the bottom, twelve plastic tubes inside it sink down and fill with mud. ROMERO: So we want to collect the sediments from the bottom because the sediments record the history of what happened in the area. LEVIN: Isabel Romero is a geochemist at the University of South Florida. ROMERO: So, every time that we pull and get sediments some of us are gonna look at the chronology. Some of us gonna look at the organics, the chemistry, to see what is the condition of the area. LEVIN: Sediment cores act almost like tree rings. Each season a new layer of mud settles onto the ocean floor and leaves a record of what happened in the water. Researchers like Romero and Hollander will look at the chemistry of the mud, while others focus on the tiny animals inside. 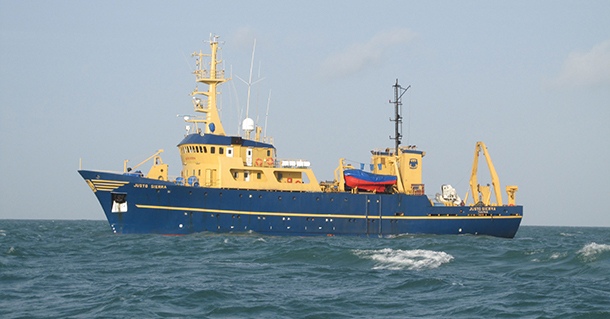 LEVIN: As the multi-corer settles back on the deck, a swarm of scientists gathers. They carefully remove and store the cores, but first they siphon water delicately off the top of each one, collecting the organisms that live there. Adriana Gaytán-Caballero is a Ph.D. student at UNAM, the national university in Mexico City. GAYTÁN-CABALLERO: [TRANSLATION] We work with organisms that are associated with sediment. Then what we see is which type of organisms are most abundant. You may see some groups, some families, that are more abundant than others if there’s some event that’s different from what they are used to. LEVIN: Some of the animals she finds are microscopic. Some are as big as an earthworm. But they all tell her something about the environment. Certain worm species can only live in pristine mud, but others are attracted to oil, and thrive in places that would kill off other animals. Studying which ones are living there can tell her how the marine ecosystem’s doing. VOICE #1: Anyone know what that is? VOICE #2: That is a polychaete. VOICE #3: Oh, a worm! Travis? 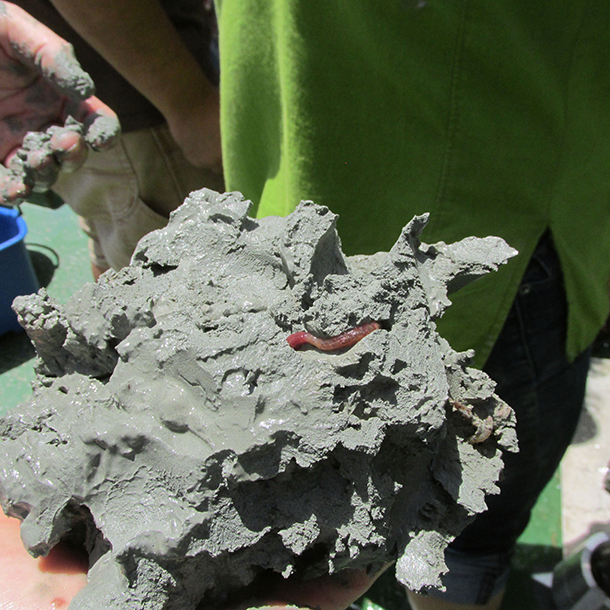 LEVIN: Like the Mexican team, Travis Washburn studies worms in the sediments. He’s a Ph.D. student at Texas A&M. WASHBURN: The two things that are constant in our work are death and gravity. So, everything dies, and everything sinks. LEVIN: In other words, contamination in the water eventually goes away, but bits and pieces of contaminated mud and dead animals settle onto the ocean floor. Those sediments stick around, and so do the worms that live inside them. WASHBURN: So they’re basically a record of the overlying water column. You can use the worms and the sediment to tell you everything that’s happened above them. LEVIN: But sediment samples don’t always paint a clear picture. In some cases, those layers of mud can be mixed up by currents or burrowing animals, so it’s tough to figure out where oil landed in the past. Looking at chemistry and animals can offer some clue, and David Hollander has a few more tricks up his sleeve. He’s borrowed an old technique used by oil workers, a UV light. It makes crude oil glow bright purple. LEVIN: Inside a dark cabin, he shows me how that works. On the table, he pours out a few tiny drops of crude, and immediately wipes them up. HOLLANDER: Oil. No oil. Right? Looks clean to you? HOLLANDER: Okay, but if I was “crime scene investigation, CSI: oil spill”, I would put on my UV lamp, and… Oh…Oh! HOLLANDER: I missed a spot. LEVIN: Yeah, it just jumps right out. HOLLANDER: See it right there? LEVIN: It’s hard to miss. A bright, glowing spot where the oil used to be. And without the UV light, we never would’ve seen it. HOLLANDER: In this instance, even very, very faint amounts that you can’t see fluoresce very distinctly. LEVIN: So, if there’s a band of oil that you can’t see with the naked eye, you’ll be able to spot it with this. HOLLANDER: Exactly. That’s why we use it. LEVIN: At each site, Hollander splits one of the cores and scans it with the UV lamp. This method gives the team a quick-and-dirty way to evaluate each site and let them know if they need to come back for more samples later. They’ve only got two weeks aboard the Justo Sierra—so they need to know at a glance where to focus their efforts. It’s not the last time they’ll be out here, though. There are a few more cruises planned over the next three years, on both Mexican and American ships. Hollander hopes this collaboration will open up new insights into the Gulf as a whole. He says getting the big picture’s essential for planning how both nations will respond to the next spill. After all, an oil slick doesn’t just stop at the border. HOLLANDER: I think there’s a globalization of these issues. The Mexican government and the Americans realized that they have potentially a problem that is shared by both countries. LEVIN: And it’s an urgent problem. Right now both countries are drilling in waters that lie right on the border. By studying how both Ixtoc and the Deepwater Horizon spill have affected the Gulf, the C-IMAGE team wants to inform policy makers in the US and Mexico. As more wells are built offshore, this research will help lay out the environmental dangers that come with them. HOLLANDER: I think that’s principally one of our major goals. These are shared marine resources. We just want to make sure that we are good stewards of these common resources that are owned by all of us and manage them appropriately. LEVIN: For Living on Earth, I’m David Levin.